Apple's top security chief told the U.S. Congress on Sunday that it had found no indication of suspicious transmissions or other evidence that its China supply chain was ever compromised (via Reuters). In a letter to the Senate and House commerce committees, Apple Vice President for Information Security George Stathakopoulos wrote that the company had repeatedly investigated and found no evidence to support Bloomberg Businessweek's bombshell report that alleged tiny chips were discovered inside Apple servers which allowed for backdoor transmissions to Chinese spies. Stathakopoulos repeated Apple's statements to the press that it had never found any such planted chips or been contacted by the FBI over the alleged matter. The letter follows a statement issued on Saturday by the U.S. Department of Homeland Security saying it had no reason to doubt the companies who denied that they had ever discovered the tiny chips. Despite the denials, which are also backed by the UK's national cyber security agency, retired Apple general counsel Bruce Sewell, and other unnamed Apple senior executives, Bloomberg said it stood by its report as of Friday, but didn't immeditately respond to requests for comment on Sunday. There are many ways to mask communications. I'm not surprised they found nothing. Name one undetectable by common practices. Fortune 500 companies employ teams of IT security experts. So please enlighten us armchair hacker. This is a Dog & Pony Show. If there's an ongoing investigation, #1, they rarely will even tell you. #2 Apple and others might not even know about it. It's even possible no one will ever know if its a vulnerability that is still existing and could be done again. The government never confirms stuff like this and strongly warns companies to do the same while secretly working behind the scenes. Everyone would be told to DENY ANYTHING. If we do find out anything, it will only be AFTER any possible issue is resolved, not during. Could be years! Bloomberg joining #fakenews now? Sad! No serious hacker enters through the front door. Thinking outside the box is all the fun. I mentioned the LZ4 frame format above, but even SSH, generally considered secure, also has the potential for abuse (although admittedly it is more difficult). The initial key exchange initialization (called a kexinit packet) contains some fields that are, in my experience, usually ignored. The potential is there for abuse as well. Generally, communication originating internally is a much more difficult thing to contain, but it certainly isn't impossible. :rolleyes: I'm actually Security+ certified, so maybe I know a little more than you do. You know some people get whole degrees from accredited universities in this stuff. Again you didn't list an undetectable way to communicate massive data with China. You listed areas that "abuse" could occur. Malware doing something is one thing. Malware on thousands of servers transmitting back to the motherland without any notice of the outbound traffic is something completely different. I have a degree from an accredited university, and I also have multiple certifications. I can send you the certs in an email if you're curious. Insulting the Security+ makes you look foolish, so please continue. That diagram and entire article looks like something out of a 1993 Popular Mechanics magazine. 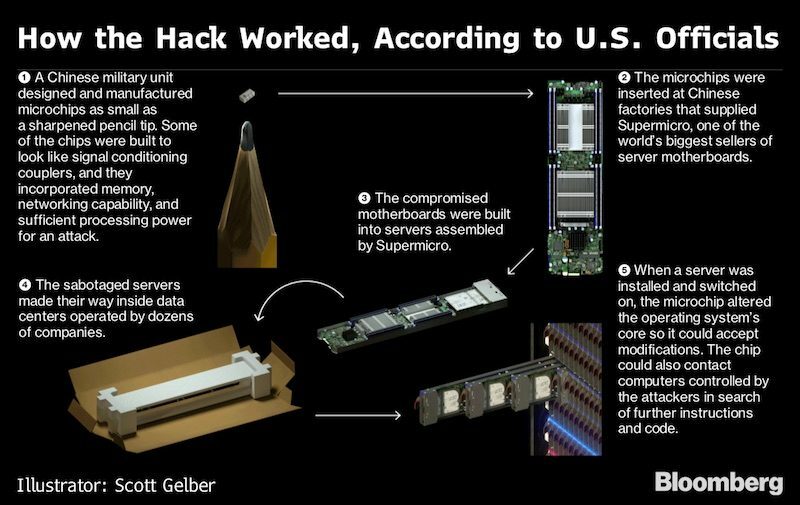 And from a quick glance, it looks like the illustrations depict china hacking our pencils! Outbound communications would be easy to detect. I'm suspecting the chips, if they exist, are not for surveillance but for a kill-switch purpose. They would be easy to detect only if they're not sophisticated. A couple protocols I'm aware of (and I'm sure many I'm not very familiar with) have either unused sections, or allow for extra data to be included, intended for custom extensions to the protocol, but if properly supported at both ends, can be used for almost anything else. The LZ4 compression's frame format, for example, allows for what are called "skippable frames", which are exactly that: user data which can contain anything, and are not parsed by the algorithm. I know of some other algorithms with similar concepts as well. It would take someone at the other end to receive the transmission, but I have no doubt that Apple communicates with third parties, some of which may be compromised, so the risk exists. Ahhh... let's continue to categorize everything that we don't fully understand or opposes our views as "Fake News" after all everyone's doing it!! Are you implying that because Fortune 500 companies employ "teams of IT security experts" that their systems can't be breached or compromised?! HA!! !